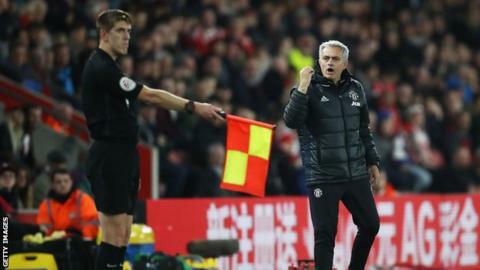 Manchester United manager Jose Mourinho says it is "frustrating" that the Premier League "doesn't care" about helping English sides in Europe. United host Crystal Palace in their last league game on Sunday, three days before the Europa League final. Victory over Ajax in Stockholm on Wednesday would earn Mourinho's side a Champions League place next season. "In any country in the world the match is on Saturday. We are sixth no matter what and Palace are safe," he said. "In seven years in England I never saw any detail of trying to care about English teams in Europe." The Portuguese appeared to suggest he had not asked the Premier League to switch the match from Sunday - the final day of the season - describing the prospect as "a lost battle". "It's frustrating for me. I don't lose time. When I know the battle is lost I don't fight," he said. Since the start of the Premier League, the final round of fixtures has been played at the same time on the same day, with the league keen to protect the competitive integrity of the season. It is understood the Premier League is also generally reluctant to alter kick-off times at short notice to avoid disruption for fans. Palace secured their top-flight safety with victory over Hull on Sunday, as a 4-0 win at Selhurst Park lifted Sam Allardyce's side to 13th. Mourinho said he will field several youngsters for Sunday's match at Old Trafford, adding: "I hope you don't kill me when you see my team. "I hope the fans on Sunday support the team, they forgive some naivety, they forgive some lack of confidence and I hope Big Sam shows he's a good friend and he goes slow. "I hope he tells Wilfried Zaha to go slow and leaves Christian Benteke at home. I hope he goes soft on us." Palace boss Allardyce said he would be fielding "the fittest team we've got". "Whether Jose plays a weakened side or not it'll be a difficult task. We've no Andros Townsend, but my team want to play at Old Trafford," he said. Asked if he would have done the same as Mourinho in his position, Allardyce added: "There's no doubt about that. It'd be wrong to risk anyone for the final. "We moan about English teams not getting near the Champions League, but there's no help from the Premier League to give him the best chance. "That wouldn't have happened abroad."